I spend most evenings on my deck, enjoying our beautiful Arizona sunsets. If you browse through the Sky Lights archives you’ll find lots of sunset photos and technical explanations about where all the colors come from. But sometimes the view to the east at sunset can be equally enjoyable. Next time you’re enjoying a sunset, turn around and look in the opposite direction. You just might see another beautiful display of colors. The interplay of atmospheric optics and local weather conditions can create some interesting effects. 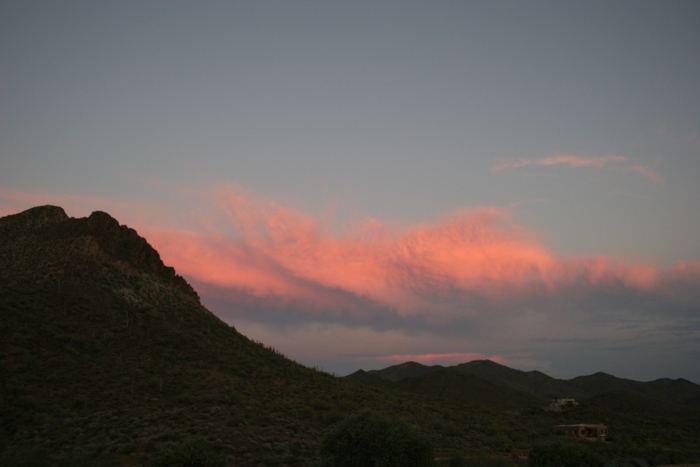 The photo above was captured at sunset, and shows the sky to the east from New River, Arizona. The low clouds were illuminated by the refracted red light of the setting Sun. It was almost like having two sunsets for the price of one. In this case, the red colors in the east almost exactly duplicated the display in the west. Spend some time looking at the sky, day or night, and you’ll see things that escape the casual observer.